Today, if you wish to get your book into a bookstore or library, you need an ISBN. What is an ISBN? How does it work? Do you need one? How you do you go about obtaining one? Read on for answers to these questions. Note: This information applies only to people living in the USA. If you live outside of the USA and wish to purchase an ISBN, you can find your local ISBN Agency here. 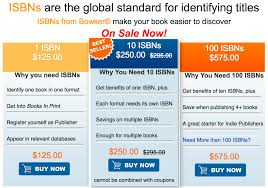 ISBN stands for International Standard Book Number and since 2007 it has always been a thirteen digit number. It identifies your book's title, author, publisher, the geographical location of the publisher, and your book's edition and format. Note: The ISBN and the barcode are not the same. The barcode that appears on the left is the EAN generated from the ISBN number. The other number, appearing on the right, is called an EAN-5 and contains the price of the book. The first digit is a 5 and must be present for scanners to read. The 4-digits after the 5 indicate the price of the book. If the price of the book changes, a new barcode must be used. If the book is published as a new edition, a new ISBN must be used. If you live in the USA you can purchase an ISBN from Bowker by clicking here. Bowker also has a setup and registration guide you can download and use here. You have the option of purchasing one, ten, one hundred, or a thousand. How many you purchase is up to you. Cost: One ISBN would cost you $125, but a bulk of ten only costs $295. If you purchase ten, each ISBN would only cost you $29.50. Buying a single ISBN might seem best if you only want to publish one title, but remember that you need an ISBN for each format. You'll also need an ISBN for any future books you publish. I recommend purchasing ten ISBNs as it seems the most cost-effective situation. -Separate ISBNs are required for each paperback, hardcover, and audio format of your book. -If you change the print trim of your book you will need a new ISBN. -Large print books need a separate ISBN. -If you change the title you need a new ISBN. -Significant changes to text or content need a new ISBN. -A new ISBN is not needed if you change the price. -A new ISBN is not needed if you change the cover. -A new ISBN is not needed if you make a minor change to text or content. -A new ISBN is not needed if you change who prints your books. Can't I Buy A Free Or Cheap ISBN From Createspace, Smashwords, or Draft2Digital? Yes, you can. However, there are some things to keep in mind. If you obtain a free, or cheap, ISBN from one of these companies you can only use that ISBN with the channels those companies distribute to. Of course, you could obtain a free, or cheap, ISBN from each of these companies, but that doesn't come across as very professional. Also, those ISBNs would identify each of those companies as the publisher. Plus, if you use Createspace's ISBN, some bookstores will refuse to carry your books. Above all, do your research and make sure you're making the best decision for you, your book, and your wallet. Note: Let's say you want to eliminate ISBNs all together and only produce an eBook. Please, take into consideration libraries. If you plan to use Overdrive to get your eBook accessed by libraries all around the world, and therefore get more exposure, you will need an ISBN. Plus some companies, such as Smashwords, require an ISBN for iBooks, Kobo, and other channels. Therefore, to get your book in the hands of more readers and drive sales, I highly recommend you obtain an ISBN even for eBooks. If you have any additional questions, or tips to help writers obtain their own ISBNs, please leave this in the comments down below.